When I was looking for a starch to accompany some grilled meats, I came across this one from Thomas Keller’s Ad Hoc at Home. Everything I’ve made from that book has been a hit, and this was no exception. The leeks, herbs, butter, and cheese make this perfectly savory (if not exactly low-fat). Wash the sliced leeks by submerging them in water and swishing them around with your hands, allowing dirt and sand to settle to the bottom. Remove from the water and drain. Place a pan over medium-high heat. Dry the leaks and place them in the pan (with no fat at this stage). Season with salt, and cook – stirring often – for about 5 minutes. As the leeks cook, gradually lower the heat to medium-low. When the leeks have released their liquid, add the butter and season with pepper. Cover the pan with a parchment lid and place into the oven, cooking for 30 – 35 minutes, stirring every 10 minutes or so. 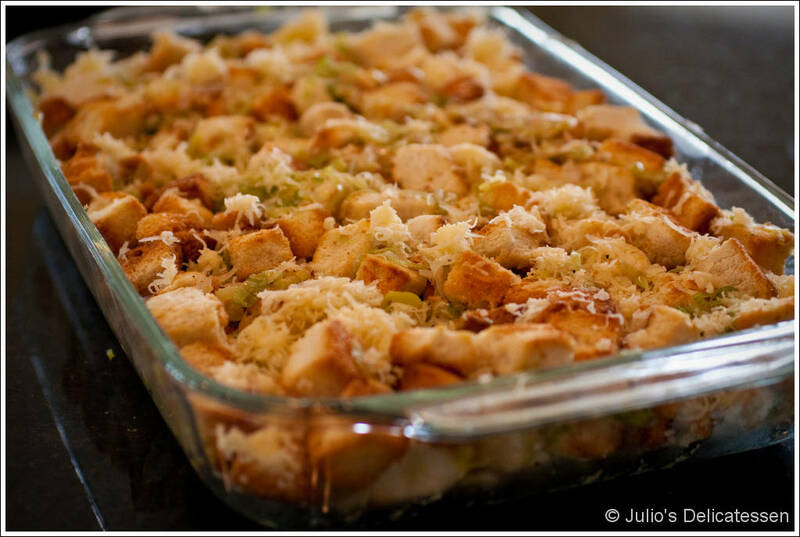 While the leeks are baking, spread the bread cubes onto a baking sheet and toast in the oven for about 20 minutes. Transfer to a large bowl. When the bread is toasted and the leeks are cooked, remove both from the oven. Leave the oven on. Add the leeks to the bowl with the bread and toss to combine. Add the chives and thyme. In another bowl, whisk the eggs, then add the milk, cream, and salt and pepper. 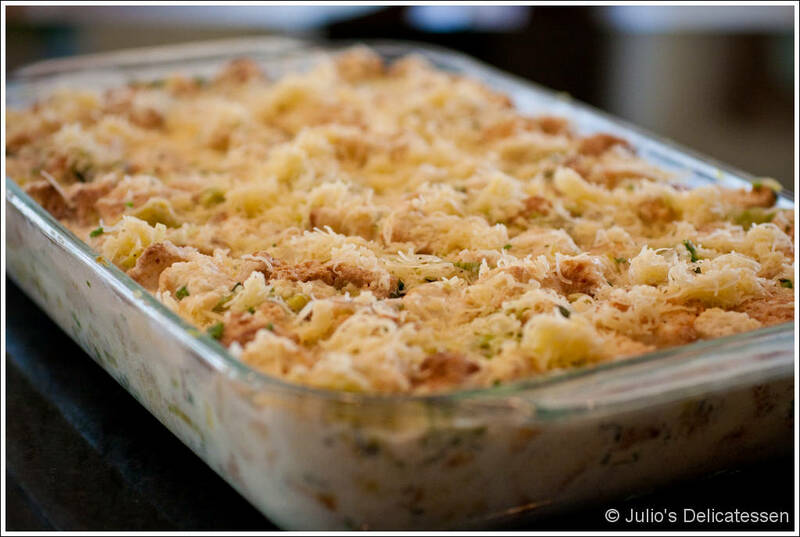 Add ¼ cup of the cheese to the bottom of a buttered 9×13 baking dish. Add half the bread-leek mixture on top of the cheese. Add another ¼ cup of cheese, then the other half of the bread mixture. 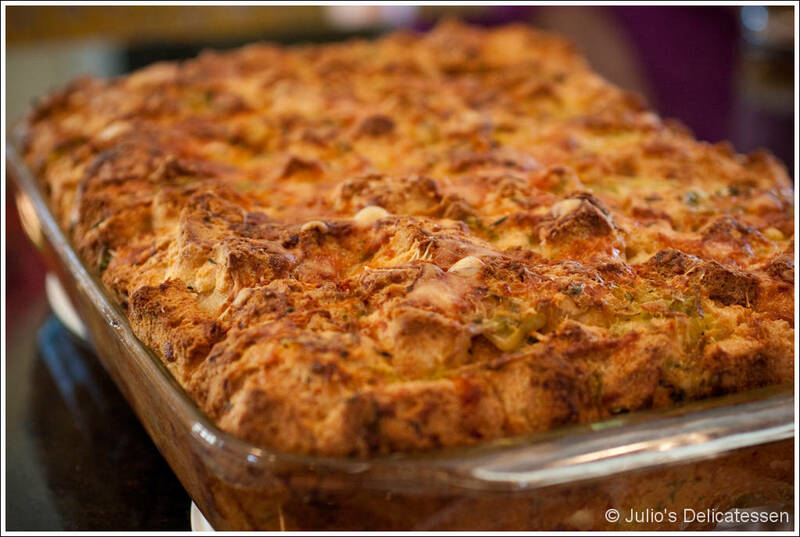 Add another ¼ cup cheese on top of the bread-leek mixture. Pour on enough of the custard mixture to cover the bread. Press lightly on the bread to make sure it is mostly submerged and soaks-up the liquid. Let soak for 15 minutes. Add the remaining custard mixture, then the remaining cheese and a little more salt. Bake for 90 minutes, or until the pudding is set and the top is browned. I would eat this again. And again. And again.